Ask fellow campers about "Breezy Point Beach & Campground" and nearby attractions. The 17 site daily campground is basically a sandy field alongside the beach. The sites 20-25 feet wide are separated by electric pedestals. Some sites have trees along side the beach so those sites get some shade. Tables and fire rings are also lined up along the beach. Sites are slightly messy. No big debris but lots of cigarette butts, bits of paper and plastic, plastic bottles, etc. The County does rake the beach. For a County as prosperous as Calvert they should do better. We camped at Breezy Point Beach & Campground in a Motorhome. My family absolutely loved this campground! This was our first time staying at a public operated campground so some things took some getting used to. We were so pleased with the campground we are contemplating getting a seasonal site next year. 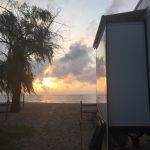 We've been all the way to the Keys and haven't had as good of an experience as we had here.... We camped at Breezy Point Beach & Campground in a Fifth Wheel. Reservations are by telephone only. This is a County Park run by Calvert County, Maryland. We camped at Breezy Point Beach & Campground in a Fifth Wheel. Rolands Grocery Store in Chesapeake Beach is the closest grocery store. Had a great time here, camper was right next to the beach, will come back more times next year. We camped at Breezy Point Beach & Campground in a Motorhome. Great park for camping. Many tent campers. Most sites are beach front. Amenities include fishing pier, playground, volleyball, Marina next door, swimming in ocean. Many "permanent" sites. This campground is great. Only downside is there is no sewer at all. I mean none. No dump station either. You need to call a company to pump your camper out or dump somewhere else. Only other option is use the park-provided pumper who comes on Mondays and Thursdays. It is included as part of permanent camper fees and is offered free to those who stay for an extended weekend (tell Monday). Excellent campground for family reunions and other group camping. The bath house is in ok shape. It is old, but clean. We camped at Breezy Point Beach & Campground in a Travel Trailer. Are you affiliated with Breezy Point Beach & Campground ?